The second data point is how many companies, including some of the biggest in the space, are replacing the leadership of their UA (user acquisition) teams and firing UA agencies they have worked with for several years. Many people I know have recently been approached for senior UA positions, and many of these people do not have significant UA experience. What is occurring is publishers are seeing a lower return on their advertising investment, or a negative return, and believe the problem is their UA team or advertising agency. The reality is that in most cases the UA team consists of the same people who were leading UA when the company was successful. They have not suddenly become stupid or lazy. They are facing a new reality where the cost of a quality user is just more expensive. It is a classic case of shoot the messenger. What is ironic is that all of these companies are targeting each others’ user acquisition team, so company A thinks it upgrades by hiring the head of UA from company B while company B thinks it also upgrades by hiring the head of UA from company A. What they are most likely to experience is that the problem is the fundamentals of the market and their apps and not the individuals. Same with the agencies, they have not gone from competent to incompetent in a few months, they are just dealing with different market realities. Multiple companies are now for sale because they can no longer afford user acquisition. As user acquisition increases, financing user acquisition from cash flow is more difficult. These companies are hoping that by selling to a well financed parent company, the situation will be resolved. This thinking, however, is flawed and points to a need to revise the underlying model. It is flawed because the companies are actually experiencing a negative return on their ad spend. Thus, by adding more financing, they are just amplifying the negative return. At the end of the day, if they are spending $8 to earn $6, it does not matter if they spend $800 or $8 million, it is not good business. Another indicator that the return on advertising is getting worse is that many companies are extending the payback period or the LTV they look at for advertising. By comparing CPIs to a 12-month LTV rather than a 6-month, or in some cases now a 24-month period, companies are implicitly reducing their margins so that they can continue to advertise. Given that the fundamentals of their game has probably not altered, they are forced to make this change to compensate for higher CPIs for the same quality user. Now, you are probably despondent or still in denial, but neither of these responses to the situation is very productive. Instead, once you understand the situation, you should build strategies to navigate it (and even capitalize on it). The first thing to look at is increasing advertising revenue in your app. Previously, many social game publishers either did not include advertising out of concern that it would impact negatively in-app purchases or if they included it, advertising was only thrown in to placate the finance team. In the evolving environment, however, the incremental revenue from advertising can offset some or all of the higher cost of acquisition. I am not going to throw out the cliché that advertising helps monetize the other 98% of your game’s audience, although it does in the past it was not needed. Now, you need all the revenue you can generate. Additionally, advertising is a particularly attractive alternative because increasing CPI means ad rates are increasing, so you could be able to monetize better now from advertising than in the past. As CPIs increase, your advertising revenue should also increase, thus offsetting your risk of increasing CPI. With the increasing cost of a new customer, the value of existing customers increases proportionally. Rather than spending $10 to acquire a new player, spend the $10 to prevent an existing player from churning. As the costs of acquiring players increase, the costs of replacing players that churn increase. Thus, it makes more sense to devote more resources to CRM (customer relationship management) and CS (customer service), communicating with existing players to keep them in your game, overcoming problems they are having, and reactivating past customers who have lapsed. One trend I am seeing is that companies are developing and publishing games that are not intended to monetize but will cost effectively acquire users who can then be directed to games with better monetization. For example, a social casino publisher may release a blackjack game, and even if it does not monetize they can acquire users for $2.00 rather than $8.00, and then direct 50 percent of those users to their slot application. Thus, they are using the blackjack app to create slot players at a cost of $4 rather than $8. Given that the root of success (and failure) is the LTV/CPI relationship, If CPIs increase, you then should increase your LTV (lifetime value). The only issue here is that every company is continually trying to increase LTV, so it is sort of like saying you should eat more vegetables. Given the situation, however, it becomes more important to think outside the box on how to increase LTV. One area is advertising, discussed above. Another is potentially the subscription model, especially if it appeals to users who do not typically advertise. This post is not about new models, and if I knew the next great model I probably would not write it here (sorry, but my employer would not be happy). The point is, now is the time to take a step back and think outside the box on how you can increase overall LTV. Multiple data points suggest that CPIs will increase, and increase significantly, over the next year. The higher CPIs mean that free to play games will no longer be able to conduct business as usual but will have to find new means to acquire and retain users and increase monetization. 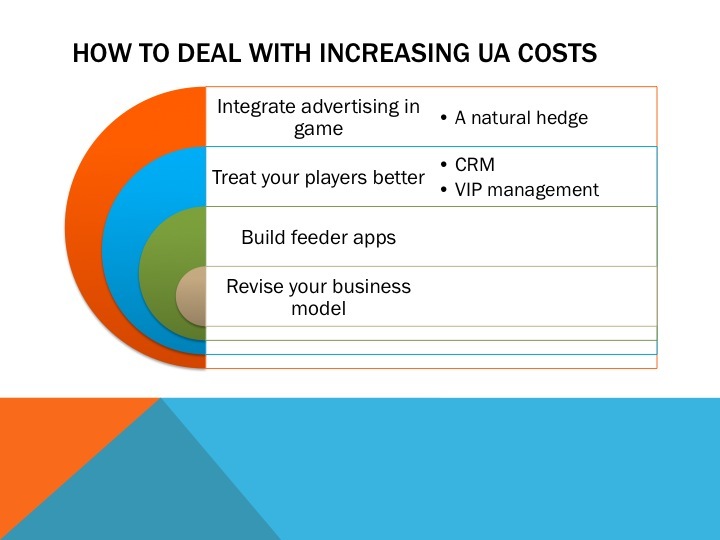 One area that is likely to alleviate the increase in user acquisition cost is in-game advertising, by increasing ad revenue in your game you are not only offsetting some of the higher UA costs but also hedging against increases in ad rates.